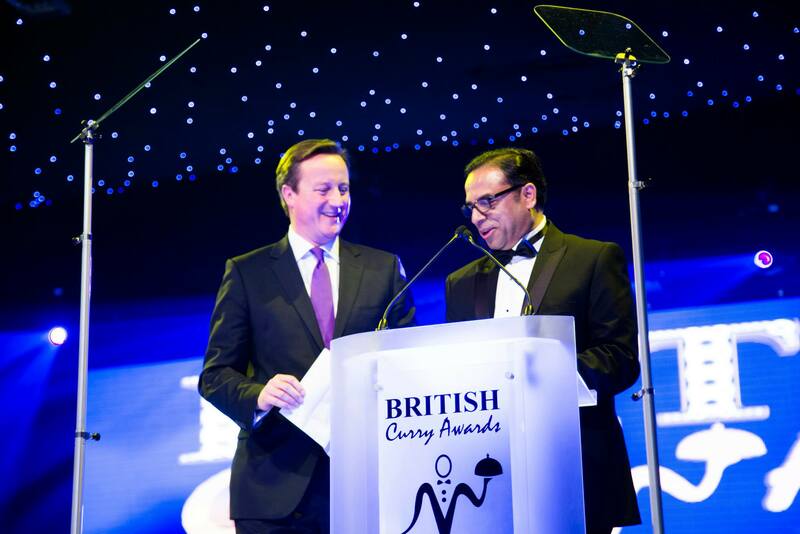 British Curry Awards 2014 celebrates ten years of honouring excellence in the UK Curry Industry. The UK’s favourite cuisine will once again be celebrated at the milestone, tenth-anniversary British Curry Awards on Monday 1st December 2014. The industry at large, foodies, celebrities, MP’s and dignitaries will collectively pay homage to the nation’s finest curry restaurants at one of the most lauded events of the UK hospitality sector, taking place at Battersea Evolution, London. A pioneer in the UK catering and hospitality sector, British Curry Awards has been lauded as a national institution in its own right – the first and landmark event to celebrate the industry’s achievements. The event is eagerly anticipated annually by the industry and restaurateurs alike, with winning restaurants realising lifetime dreams through being awarded. As Prime Minister David Cameron said at the event last year, “These awards have become a fixture in our national life. They are, as I put it, the Oscars of British Curry. I’d like to say a big thank you to all of you who work in this great industry – 10,000 restaurants up and down our country, three and a half billion pounds worth of turnover, two and half million customers every week. I reckon that is about 31 million chutney trays, 62 million naan breads, 160 million poppadoms. As we say in Westminster, a light lunch! The nomination process invites members of the public to put forward their favourite Indian eatery for a deserving accolade. This year, a phenomenal 200,000 public nominations have been received via post, app and online, from diners nominating their favourite curry restaurants, with 2,641 restaurants being nominated. It is stated that a curry remains the favoured choice of takeaway across the nation, overtaking stalwarts such as a Chinese or Italian. Its value is reflected by the Best Delivery Restaurant / Takeaway Award, in association with Just Eat, the online takeaway ordering service. Each year British Curry Awards also presents the Special Recognition Award to an influential culinary personality, with past winners including Atul Kochar. Madhur Jaffrey, Cyrus Todiwala OBE, Anjum Anand, Heston Blumenthal OBE, Shelim Hussain MBE and Mohammed Aslam MBE.